Blue. The reflection of light between violet and green on the visible spectrum, an emotion that bespeaks sadness, a tart round berry, the color of sea and sky – also a tactic for raising Dystonia awareness. We’re in the midst of Dystonia Awareness Week (June 2-8) and the “Go Blue” movement is coloring locks of hair, influencing shades of dress, painting sultry eyelids, and burgeoning blue awareness ribbons and bracelets to get the world chattering about Dystonia. Blue abounds in a variety of hues: azure, cobalt, cornflower, cyan, indigo, midnight, navy, periwinkle, powder, royal, sapphire, teal, turquoise…and let’s not forget those baby blues. Choose your shade and conduct your own Dystonia 101 class! Be creative, perhaps you’re inclined to sing the blues or fly with the bluebird. 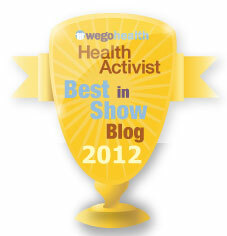 As you can see, my blog’s “gone blue” for Dystonia! This entry was posted in Inspiration and tagged Awareness, Awareness bracelets, Awareness ribbons, Blue, Bluebird, Conditions and Diseases, Dystonia, Dystonia Awareness Week, Health, June, Movement disorder, Neurological disorder. Bookmark the permalink. of course we must spread everything the dystonia consciousness. Only something will happen in the heads of many people. Forwards look. Giving up is no option. natürlich müssen wir alle das Dystonie Bewußtsein verbreiten. Nur dann wird etwas passieren in den Köpfen von vielen Menschen. Nach vorne schauen. Aufgeben ist keine Option. I feel stupid. 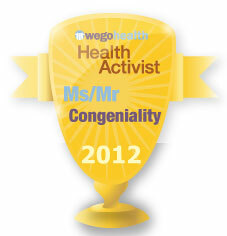 I clicked on the link to your page because WEGO shared it and I love WEGO. I read this post but didn’t know what Dystonia was so I opened another page and googled it. Then came back to your page and there at the top was a WAY better explanation of what Dystonia is than Wiki offered. What a frustrating (total understatement!) and Im sure sometimes debilitating (depending on severity – Im sure) chronic decease. I haven’t yet had time to really read many of your posts. Just this one really. I find it awesome that so many chronic illnesses use the color blue. We use it in the diabetes community too. (I have two kids with Type 1 diabetes). Also it is used for Autism (lots of friends in that community as well). I think there are more as well. It makes sense really – blue is a color often associated with sadness (depression in people with chronic decease is so common) but also the color of HOPE – like the pacific ocean ( I always hear Morgan Freemans voice in regards to Hope from the movie the Shawshank redemption – “hope is a good thing. maybe the best of good things. and no good thing ever dies” – he goes on to say that he hopes the pacific is as blue as he imagined. Blue=Hope. Anyway – just thought Id say hi and wish you well always. 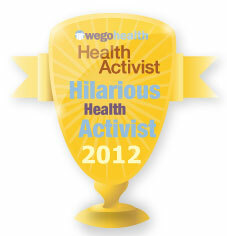 Thanks for being a health activist and sharing your knowledge with us all. Great idea. We definitely need to spread awareness. It’s so good to find your blog. My son has Dystonia and I’ve decided to write a post each day this month about Dystonia for Awareness. Today we are getting out and going to an expo for speech technology. We will be sure to “Go Blue”! 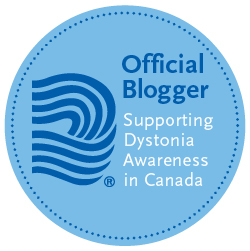 Hi Pam I have worn a blue shirt each day this this week to stand for dystonia. I missed it. So I will have my own self-sponsered blue day for @Dystonia. Aquamarine is my birthstone. I have had to deal with fractures and sprains lately. So bunch of Docs, RN, & others now know what it is.